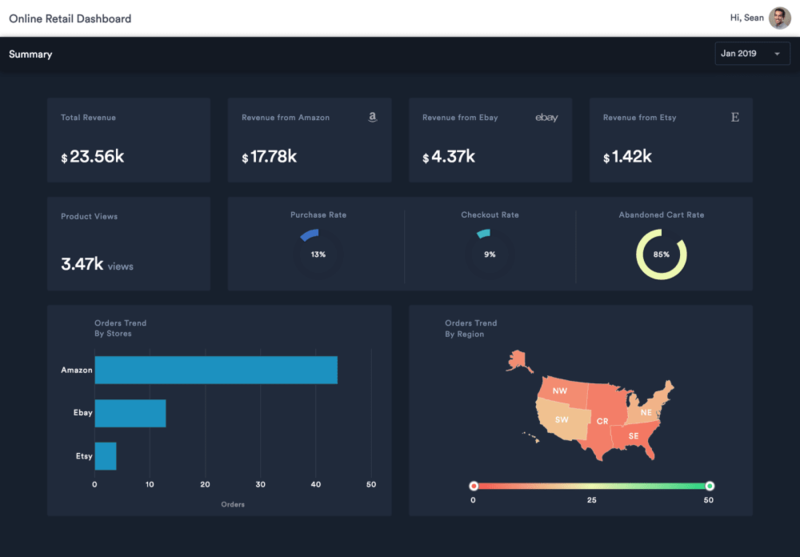 In this tutorial, we’ll be focusing on creating a dashboard for an Online Retail Store. Online Retail Stores generate revenue across other e-commerce giants, apart from their own website. This dashboard focuses on showcasing a monthly performance of an online store across three e-commerce aggregators - Amazon, Ebay and Etsy. Further, we have used a combination of Charts, Maps, and KPI elements to showcase how different sources of revenue are performing, and from which geo locations are maximum orders are coming in from. Hope you have as much fun building this dashboard, as I did! Including FusionCharts core package, it&apos;s React Component and FusionMaps package We will be using FusionCharts to render charts in our dashboard app. You can go ahead and check out more about it here. For any references, you can check out the source code from this Github repository. If you have any questions/feedback, comment below or yell at me on Twitter!